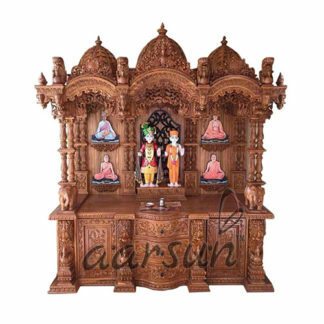 Aarsun woods brings to you the handmade puja temple made up of fine teak wood which give traditional and sophisticated look to the temple.The temple at the back side of the temple there is beautiful floral and leaf carving done over there. the temple has beautiful piers at the front of the temple which gives very elegant look to the temple.There is beautiful mehraab area at the roof top in which fine beautiful floral and peacock work is done which give very sophisticated look to the temple. Below that there is main place for the deity where you can place your idols and worship them.There are strong pillars and railing carved at the front and at the back of the temple there is fine kalash and floral craving done by our skilled artisans. At the base of the temple there are carved drawers for puja essentials and below that there is circular design is carved over there. 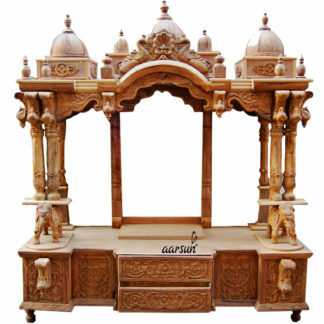 The temple is mounted on curve piers.The temple is fully carved by our skilled artisans and it give very traditional and sophisticated look to your home. Teak wood is the deciduous tree which is used from the centuries for making wooden furniture’s. has its own natural oil which helps it to be termite and pest free. It is one of the most durable woods even when it is not treated with oil or varnish. We always use the old timber in making our products because the timber from old trees is more durable and harder in comparison to plantation grown trees. Teak wood is mostly used in making outdoor furniture’s and boat decks. Over the time teak wood can change its co lour into silvery grey finish when exposed into sunlight.